You are here: Home / Product / Giveaways / Maps International Mother’s Day giveaway! Maps International Mother’s Day giveaway! I absolutely jumped at the chance when the lovely people at Maps International got in touch and asked me to review a map and offer one for a reader to win in a Mother’s Day giveaway. I love their prints and maps; have you seen them? Go over to their website and take a look – they have loads of brilliant prints to hang on your wall. I have received my print for review. I’ll write another post about that (and why it says Worst Trip Ever underneath), but here’s a quick peek. Maps International do lots of other maps that will make a brilliant present for your mum, mother-in-law, or partner – the centre of your world! Remind her of how important she is this Mother’s Day, and let her know that your heart is at home with her, with these beautiful, personalised map prints. These personalised UK postcode prints are a great way to show mum that she’s always in your heart, or for remembering special times and places you’ve visited together. The ‘Home is Where Mum Is’ canvas map is a thoughtful gift that can be customised to display any UK postcode. For memories further away from home, or for a more personal Mother’s Day message, this UK postcode print makes a completely unique gift. 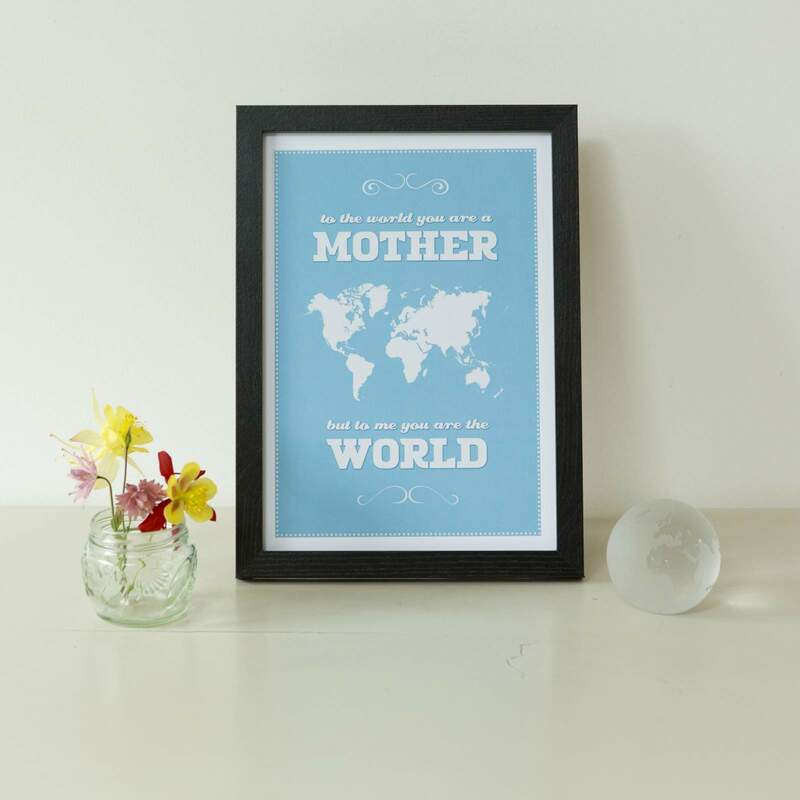 This stylish, bold ‘Mother’s World’ print is the perfect way to make a statement and let mum know that she means the world to you. It comes in 4 vibrant colours, with the option to frame, this print is one that she will be proud to display in any room in the house. These unique, bespoke gifts are perfect for Mother’s Day, but also for any other time of the year. 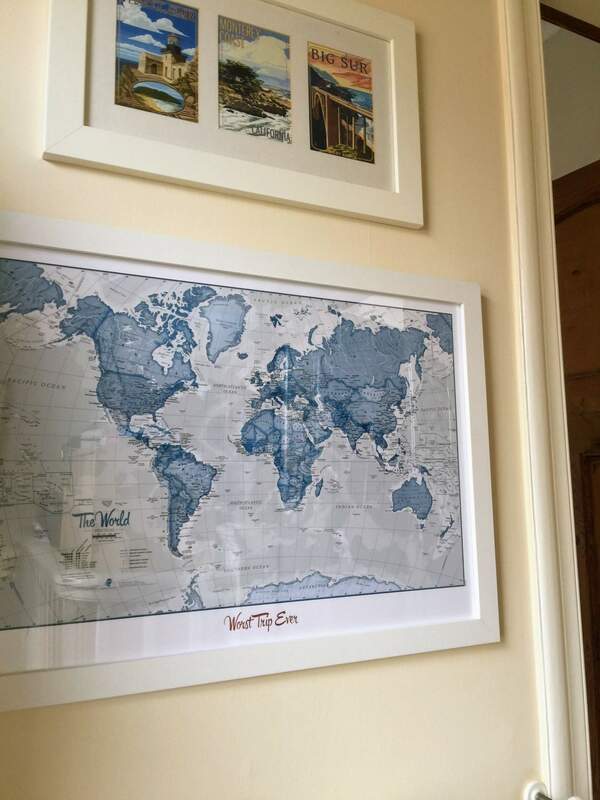 The specialist cartographers at Maps International have been designing and making quality wall maps and prints for over 50 years, for travel lovers of all ages, all over the world. I have teamed up with Maps International to offer one lucky reader the chance to win a Home is Where Mum is postcode canvas. Enter below. If you have any questions, don’t hesitate to ask! Giveaway ends 19th March. I’ll be drawing the winner on Monday morning so check your inbox! You will need to respond quickly if you want to have your print with you by Mother’s Day. UK entrants only – the prize can only be delivered to a UK address.